Direction (1-5): Read the following information carefully and answer the questions given below. Eight persons P, Q, R, S, A, B, C and D are living on a eight storey building in such a way that the ground floor is numbered one, the above one floor is numbered two and so on till the topmost floor is numbered eight. The persons who are living on the even numbered floors like four different fruits namely Apple, Banana, Grapes and Papaya but not necessary in the same order. More than three persons living between A and the one who likes Banana. A neither likes any fruits nor lives on the ground floor. S lives immediately below the one who likes Grapes. Two persons are living between S and R. Atleast one person lives above R. As many persons live between the one who likes Papaya and R is same as between B and the one who likes Papaya. P lives immediately below D. As many persons living below D is same as above Q. P does not like any fruits. 1. 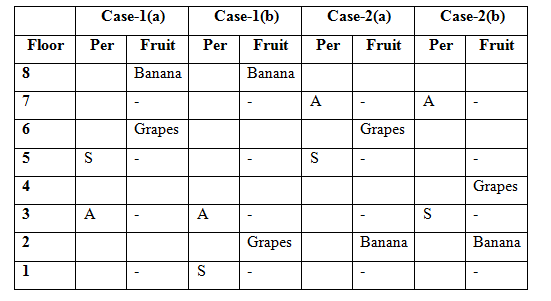 R likes which of the following fruits? More than three persons living between A and the one who likes Banana. A neither likes any fruits nor lives on the ground floor. S lives immediately below the one who likes Grapes. Two persons are living between S and R. Atleast one of them lives above R. As many persons live between the one who likes Papaya and R is same as between B and the one who likes Papaya. 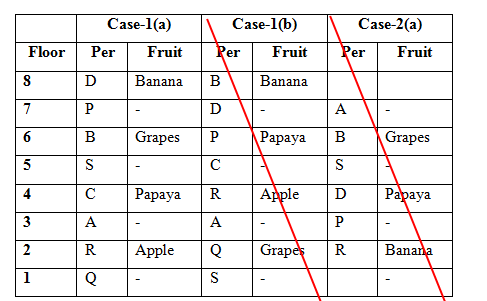 P lives immediately below D. As many persons living below D is same as above Q.
P does not like any fruits. 2. How many persons sitting between D and the one who likes Papaya? 3. Four of the following five are alike in a certain way and hence form a group. Which one of the following one that does not belong to the group? 4. Who among the following persons lives on the sixth floor? 5. If P is related to R and A is related to B in a certain way. Then, S is related to which of the following? Directions (6-10): Each of the questions below consists of a question and two statements numbered I and II given below it. You have to decide whether the data provided in the statements are sufficient to answer the question. Read both the statements and give answer a) if the data in statement I alone are sufficient to answer the question, while the data in statement II alone are not sufficient to answer the question. b) if the data in statement II alone are sufficient to answer the question, while the data in statement I alone are not sufficient to answer the question. c) if the data either in statement I alone or in statement II alone are sufficient to answer the question. d) if the data in both statement I and II together are not sufficient to answer the question. e) if the data in both statement I and II together are necessary to answer the question. 6. Six persons A, B, C, D, E and F are sitting in a circular table and all of them are facing centre of the table. Who among them sits second to the right of D? E sits second to the right of C. Only two persons are sitting between D and A. Only one person sits between A and F. D is not an immediate neighbour of C.
7. What is the code for ‘Score’? ‘get your score’ is coded as ‘bt wt et’ and ‘he may get’ is coded as ‘wt st vt’. We can’t conclude the code for ‘score’. 8. In which of the week days that Arun travelled to Mumbai? Arun’s mother correctly remembers that, Arun travelled to Mumbai after Wednesday and before Saturday but not on the Thursday. Arun’s sister correctly remembers that, Arun travelled to Mumbai one of the days between Tuesday and Friday. From the statement-I, Arun’s mother correctly remembers that he travelled to Mumbai on Friday. 9. 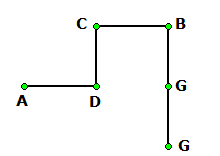 In which direction is point D with respect to point G? Point A is to the west of point D, which is to the south of point C. Point B is to the east of point C. Point G is to the south of point B. From the statement-I, we can’t conclude the direction of point D.
10. How is R related to W? W is only son in law of P. T has only one child. R is only daughter-in-law of S, Who is mother of W. S has no daughters and has only one son. Eight persons P, Q, R, S, A, B, C and D are living on a eight storey building in such a way that the ground floor is numbered one, the above one floor is numbered two and so on till the topmost floor is numbered eight. The persons who are living on the even numbered floors like four different fruits namely Apple, Banana, Grapes and Papaya but not necessary in the same order. More than three persons living between A and the one who likes Banana. A neither likes any fruits nor lives on the ground floor. S lives immediately below the one who likes Grapes. Two persons are living between S and R. Atleast one person lives above R. As many persons live between the one who likes Papaya and R is same as between B and the one who likes Papaya. P lives immediately below D. As many persons living below D is same as above Q. P does not like any fruits. 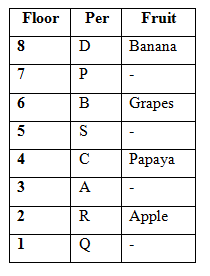 1) R likes which of the following fruits? 2) How many persons sitting between D and the one who likes Papaya? 3) Four of the following five are alike in a certain way and hence form a group. Which one of the following one that does not belong to the group? 4) Who among the following persons lives on the sixth floor? 5) If P is related to R and A is related to B in a certain way. Then, S is related to which of the following? 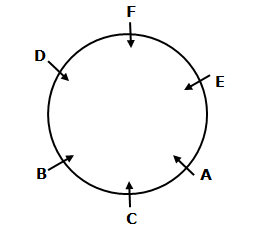 6) Six persons A, B, C, D, E and F are sitting in a circular table and all of them are facing centre of the table. Who among them sits second to the right of D? 7) What is the code for ‘Score’? 8) In which of the week days that Arun travelled to Mumbai? 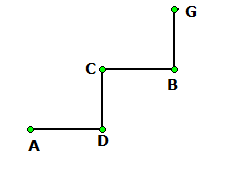 9) In which direction is point D with respect to point G? 10) How is R related to W?